Holy moly - I haven't blogged since last year! Okay, I'm done with the corny-ness. I know a lot of bloggers intentionally took a "blogging hiatus" between Christmas and New Years, but that was not my plan at all. I actually had planned to recap 2013 and tell you all about my wonderful Christmas and a few other things, but life kinda got in the way. First, I got deathly ill for the four days surrounding Christmas and couldn't bring myself to do more than shower and lay on the couch all day. Then there were all of the family gatherings, and not to mention going to work. There are still time for recaps though, but not today because I still don't have the energy quite yet. Today I'm going to talk about my plans for 2014. I've never really been one to have strict "resolutions" for the new year like "lose 20 pounds" or "save X amount of money" but I did want to make some goals for this year. My goals aren't quite your traditional goals or resolutions though. Maybe you could call them un-resolutions. Step on the scale every day. At the end of 2012 I got my first big girl gym membership and started seriously working out five (most of the time) days a week. I lost about 15 pounds right away and I have kept it off, however I obsessed over that number on the scale. Stepping on it every day (and sometimes more than once a day) to see if that number had moved. Even though I will continue to work out, nourish my body, and live an overall healthier lifestyle, I will not be focused on the number between my feet. Compare myself or my life to others. If there's one thing that blogging has taught me, it's that there will always be people who have more, who can do more, who know more, than ourselves. And even though comparison can make us strive to better ourselves, if we are always focusing on obtaining the things that other people have, then we will never be happy with what we already have. Get too caught up in blogging. Don't get me wrong, I love this little place of mine, and I will continue to blog on a regular basis. But will it be five times a week? I don't know. 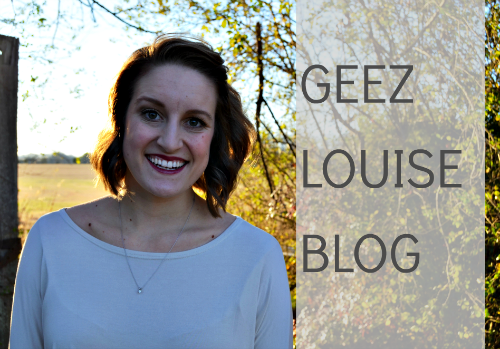 I've felt the direction of my blog changing over the past several months and I am loving every step of it. I guess you can say I've found my "blogging voice" and I'm just letting it take me wherever it goes. Let my blog fall apart. Wait? Didn't I just say I wasn't going to get too caught up in blogging? Well, yes I did, but I also want my blog to flourish in the best way that it can. I don't mean by growing in numbers, but growing in readers; in true, real, meaningful friendships. In 2014 I will focus on connecting with other bloggers with whom I share common interests and who genuinely care about me and my blog instead of focusing on how many people "follow" my blog. Let the little things stress me out. I am a big over-thinker and over-reactor and this is something I want to change about myself. I know it won't be an easy task but admitting you have a problem is the first step to recovery, right? Plus, how can I be happy about my life and all of the blessings in it if I'm too busy stressing about silly things like how much I don't like my in-law's dog. So what are your New Year's resolutions (or un-resolutions)? #1 and #2 are DEAD on for me! I'd like to grow my blog (with meaningful readers, love the way you put it) and stop beating myself up over the little things too! My other resolutions are on the blog today. I am obsessed with #1.. Sometimes my husband hides the scale from me so I can't see what I weigh. I love all your "unresolutions." OH I like this! And I really like that you are calling them un-resolutions. The word in itself gives me anxiety. I didn't plan on taking a hiatus either and it just kinda happened! And what a great list... I hope you can let go of these things! What a great list. I love the first one. I try to only weigh myself once a week. I want to grow my blog but I don't want it to keep me from life either if that makes sense. Hope you find the perfect balance! This is SUCH a good list! Totally practical and reasonable ... you're so smart. 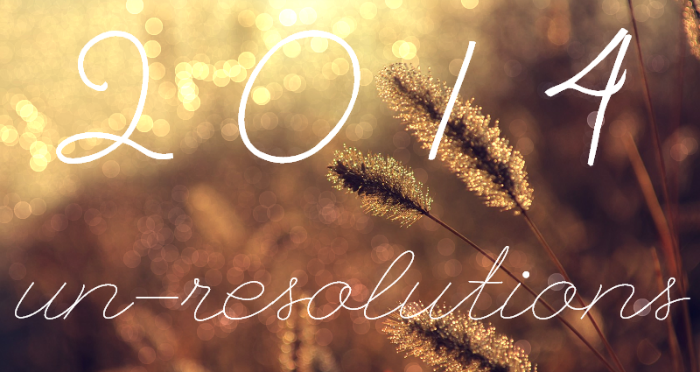 Love your non resolutions! They aren't all about what you are going to do xyz but about things that will make you a better happier person and improve on the goodness you already have going on. Happy New Year!! I love the idea of un-resolutions, and this is a great list. I definitely need to remind myself to not compare myself to others and to not let blogging stress me out so much! i am loving all of these!!! and yes to not stepping on the scale i really cant do that or i FREAK out. Love this perspective Un-resolutions! Happy New year! I think these are really great things. I especially need to consider the first two for myself. I have a nasty habit of checking my weight on the scale daily. And I most definitely compare myself to others far more often than I should. I need to remember that I'm not them and where someone elses life is right now isn't where mine is necessarily supposed to be. i'm going to steal your unresolution for stepping on the scale. that shyt just needs to end because i always step off depressed. It's like you read my mind! I can relate to everyone of these. And I love the idea of un-resolutions. These are great (un)resolutions. I started my blog, A Moyer Adventure, last fall then life happened, and I just started back at it the other day. I'm not striving to be one of the "popular" blogs, but I would just like my little space to be something I can look back on down the road to assess my life, my accomplishments, things I need to work on, etc. So many people are getting sick this year... well, you obviously know that since you're a nurse!! No escaping it in that line of work! I like what you said about gaining more readers rather than followers. That is something I have always reminded myself of: that they are NOT one in the same! I cannot tell you how much I love this post, girl! I agree with EVERYTHING you said...literally, every single word. You're so motivating!! Happy new year!! Why I am always so late to great posts? I loved this, having unresolutions and not resolutions. Loved your actual unresolutions too! Can't wait to follow along in the new year! OMG. 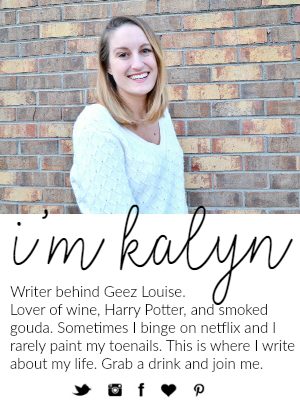 My name is Kaylyn :) We're twins! Great list of what NOT to do this year! I love how you changed things up instead of doing a typical resolutions list!